Violin player and singer Titi Winterstein was born in 1956 and by the age 15 he was already playing in Häns.che Weisse.s guitar quintet. When he was 21 he founded his own group and its other members are: Ziroli Winterstein (solo guitar), Holzmannno Winterstein (guitar) and Banscheli Lehmann (bass). 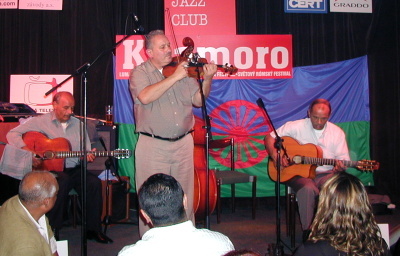 He contributes to an enormous progress of Gypsy music in Germany by his magic precision and imaginativeness. Titi Winterstein with his ensemble guarantee high quality of music production, which is defined by a remarkable diversity, which doesn.t disturb the composition. 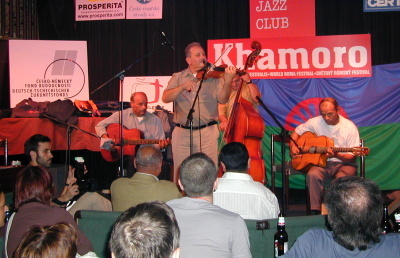 His production involves swing and traditional Roma music from Hungary and Russia. Titi Winterstein has recorded six albums and two compilations. In 1987 he recorded one of the best albums On Boulevard with Vanessa Merstein & Sorba Kwiatowski as host musicians. 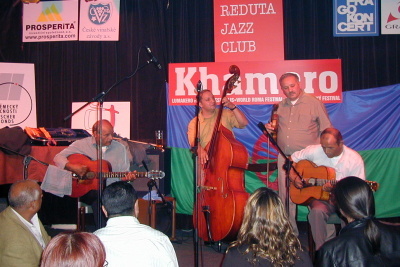 This album is a combination of traditional Roma music and Gypsy jazz and swing. The other records are Djinee Tu Kowa Ziro, Maro Djipen and The Best Of. Also in section "Current images"